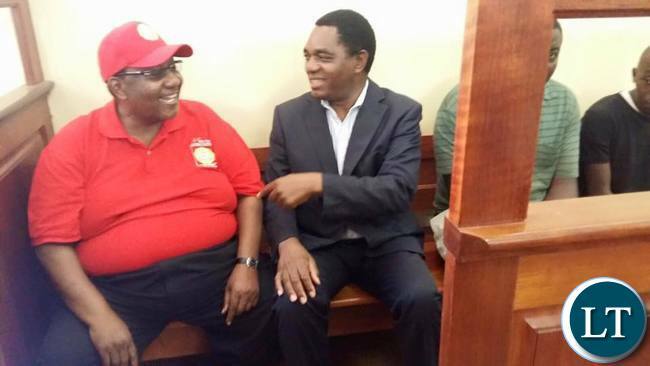 UPND Vice President Geoffrey Mwamba and 19 others this morning pleaded not guilty to a charge of unlawful drilling when they appeared before the Lusaka Magistrate Court. Before Magistrate Mwaka Mikalile was Mr Mwamba and 19 others of unknown addresses who have been charged with unlawful drilling without the permission of the Republican President. Details of the offence are that between 13th and 27th February 2015, Mr Mwamba engaged 19 youths in military practice without the permission of the President. The youths are also facing one count of engaging in military practice without the permission of the President. BAD COMBINATION AND SOME OF YOU ARE WISHING THEM TO TAKE OVER PLOT ONE. GOD FORBID VIVA PF AND VIVA EDGAR CHAGWA LUNGU. Dull people, if someone beats up your children, rapes your wife, steals your food and money you will still be saying we will vote for him! God neglected to give you any brains when you were born! Balekeni Bantu bakayele.Nanga Bantu bakayenda musanga muzayiwona all wat u will hear is uku so and so…..my town mungankale military training but Ba PF that why Guy Scott is say in PF there is too much matuvi! He is wel come as he is one of our own and we will continue voting for him. A word of advice to GBM and team, please avoid using your phones and conversations in your office and other obvious places, because they may have been bugged when the premises where broken into by the security wings which could subsequently be used as evidence in the trial. Without the permission of the republican president…..Kikiki this is a kachepa type of reporting. Too childish and under 5. The State should turn 1 or 2 boys as state witnesses and cut a deal for them not to be incarcerated. When are we going to see the court case of the Bweengwa kidnappers for which PF were jumping and shouting all over the place ? we are waiting ka…. “without permission of the President” Koswe Lungu does not own Zambia and therefore nobody should get permission from him, but the Zambian law system. On other note, GBM need to start to workout, he obese is alarming, what he can’t afford gym membership or just get himself some equipment? If only he was educated he would know the importance of staying health. Good luck with that cholesterol in your system. People please its global even obama got catapults and golf sticks or the police officers are just as clueless,visionless,brainless,useless,hopeless and a drunkards as their chief in commander Wrungu. GBM , for Upnd Presidency, he not a coward , unlike …………………..! u are all in for it?.